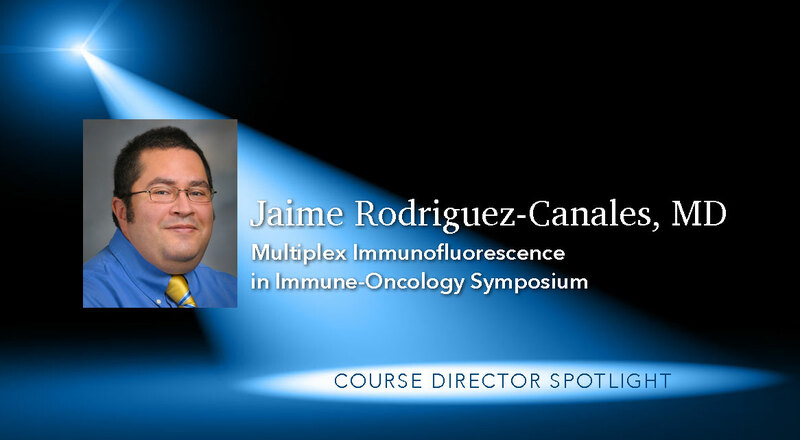 Dr. Rodriguez-Canales is a Senior Pathologist at AstraZeneca*, and Course Director for the Multiplex Immunofluorescence in Immune-Oncology Symposium held by Bio-Trac. After a successful first annual Symposium and Workshop, we had the opportunity to catch up with Course Director, Dr. Rodriguez-Canales, to discuss his feedback on the event and the importance of Multiplex Immunofluorescence in the field of ImmuneOncology. *MedImmune corporate brand was retired as of 2/19. All references have been updated to AstraZeneca. Why is multiplex immunofluorescence important to the field of Immunotherapy? "Cancer immunotherapy is an ongoing biomedical revolution as it has been just recognized with the Nobel awards to Jim Allison and Tasuku Honjo. A key tool for the development of cancer immunotherapy is the immuno-profiling of tumor tissues to identify potential new predictive biomarkers than can help to choose the right therapy for individual patients. In this regard, multiplex immunofluorescence and multispectral analysis has become one of the most important tools for immuno-profiling of patient tissues in clinical trials." What Makes this Symposium Unique? "To the best of my knowledge, our course is unique, composed not only by a symposium but also a laboratory workshop on multiplex Immunofluorescence and its applications to immuno-oncology." Who participated this inaugural event? "For the symposium we had the opportunity to congregate the top scientists in the field, from major cancer centers such as the Earle A. Chiles Research Institute, Johns Hopkins Medical School, MD Anderson Cancer Center, National Institutes of Health, and Yale University. We also counted with the valuable participation of companies leaders in the field like Definiens and Indica Labs. Our course was organized by myself and Mike Surace, both from the Laboratory of Pathology at AstraZeneca, and we counted on the key collaboration of PerkinElmer and Bio-Trac, which were instrumental in the success of our course." Why is this topic important for your work at AstraZeneca? "For AstraZeneca this course represents a unique opportunity to interact with key scientists in the field and explore potential collaborations in pathology and immuno-oncology "
What can people expect in the future around this course? "Due to the success of our course and the great feedback that we are receiving, we are planning to continue with this course annually, keeping the topics updated to the new developments in the field, and we hope to continue counting with the organizational support of Mark Nardone at Bio-Trac."